The Fly Air is the ultimate toy that everyone can enjoy. Easy to carry, straightforward to setup, strong, stiff and durable, the neatly packed Fly Air’s inflate into four finely tuned shapes for flat water fun and small surf action. Inspired by Fanatic's popular Fly composite range, the Fly Air is the convenient answer to limited storage, city life and travellers’ demands. 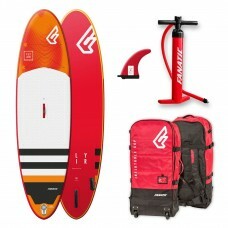 The all-round, Longboard style outline offers a great mix of glide, stability and all terrain versatility. Optimised thickness provides outstanding rigidity without additional air pressure, whilst the extra volume caters to those looking for an even easier ride. The Fly Air comes in four sizes, 9’0”, 9’8”, 10’4” and the super floaty 10’8”. Additional side fins supply extra grip when catching little waves. To outline our leading standards in terms of quality, design and durability, they offer the Fly Air in two constructions; Lightweight Stringer technology, as well as Premium construction with Double Layer Light technology, and additional third layer rail-bands. Quite simply, this is the best inflatable SUP construction available on the market with an incredible stiffness: weight ratio. Great attention to detail ensures fast and easy inflate / deflate functions and effortless transportation. All Premium Fly Air models feature a mastfoot insert for windsurfing option. Size --- Please Select --- 10'8" ($1,849.00) 10'4"